Greek, to those far away. Verse 15 tells us that it is 9am in the morning. Strong sunlight on the left illuminates this scene. In the foreground, from left to right: Simon/Peter, Andrew (Simon/Peter’s brother), with the back of Matthew/Levi behind him, James (son of Zebedee), with the un-named female disciple in green head scarf, behind him. In the background, there are various people in the crowd, listening to Simon/Peter & the apostles. I have created two versions of this scene, this is the “Sunlight version”, which concentrates on maximising the tonal contrast (light & shade) of the scene. 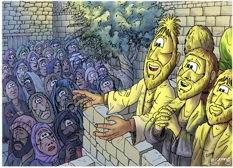 Notice the blue (shadow) colour cast over the crowd, whilst the background wall, tree & Apostles have a strong yellow (sunlight) colour over them. The previous scene (called the “Colour version”) concentrates on maximising the colour of the figure’s clothing & surroundings, with more subdued tonal (light & shadow) contrasts. 1) The man in red/brown, who’s hand gestures indicated that he believed the apostles/disciples have been drinking. In this scene he is looking terrified & worried. 2) The man in grey/blue, who’s hand gestures indicated that he believed the apostles/disciples were mad! In this scene he is walking off to the left, with eyes closed, clearly unconvinced by the apostle’s words. 3) The young (unbearded) man in brown has his arms folded & is listening to what is being said. These three men represent the three conditions everyone can experience when listening to someone talk about the gospel of Jesus the Christ: 1) conviction & acceptance, 2) disagreement & rejection, & 3) “sitting on the fence” or simply undecided, waiting to hear more. The crowd’s various facial expressions. I have deliberately shown a variety of reactions to the apostle’s words, on the faces of the people in the crowd. Some people are smiling (accepting of the message), some are looking interested, some are looking bemused, whilst others are neutral, or hostile to the words being spoken. Any of the listening crowd in my cartoon illustration who has tears in his/her eyes is indicative of deep conviction at hearing the words of Simon/Peter & the other apostles. There is a particularly strong conviction in the man who has pulled a blue cloth over his head, now there’s strong conviction! This is all true of anyone’s actual response upon hearing the gospel of Jesus the Christ: some people welcome the “Good News” with open arms, some people are cautious & uncertain, some people are hostile to it. You can be certain of one thing: if the “Good News” of Jesus the Christ is preached, there will be some kind of reaction in the hearer!